The New Commonwealth (or The New Commonwealth of the Americas as it is known officially) is the largest and most powerful single nation on Earth. It is an austere totalitarian theocracy covering all of north and central America, Greenland, Iceland and Britain, plus most of Chipangu [Japan], the islands of the Pacific, the Philippines, England-in-the-South [New Zealand], New Eden [New Guinea] and parts of Terra Australis [Australia]. It has an average level of technology, but is the most populous of the Great Powers, with some four hundred million citizens, and a vast manufacturing capability, helped by its public education system, 'virtuous economics' and strong work ethic. Its capital is the city of Boston. The government of the New Commonwealth believes that the New Commonwealth has been appointed by God as the Saviour of the world, and that all of the other nations of the world as threats to its One True Way. As such they need to be converted to that One True Way. By force if necessary. And as such all religions other than Puritan Calvinism are banned. For this reason there are many underground organisations of Catholics and others who are persecuted by the state for their beliefs all across the New Commonwealth. It has been ruled since its formation in the late seventeenth century by the Cromwell's, who fulfil the office of Lord Protector. Below the Lord Protector is the Council of State, who advise and administer the New Commonwealth for the Lord Protector. Below the Council of State is Parliament, an organisation of one house to whom members are elected by the eligible voters of the New Commonwealth. These include all male citizens over the age of twenty-one, and all married women over the age of thirty, all regardless of race. Parliament has no power over the Lord Protector or the members of the Council of State, but can legislate on many matters, and advise those above it, or even, very rarely, censure them. The various Cromwells have sometimes been puppets of other interests in the state or the Council of State, but have also often been their own men. The people of the New Commonwealth commemorate (in church ceremonies), but do not celebrate (via parties or festivals), Christmas, Easter and Thanksgiving. Levels of taxation - tithes as they are known in the New Commonwealth - are high. Much of this taxation funds the government, military and church, but some also funds the most extensive welfare state in the world, which includes medical care and educational funding. Most locations in the New Commonwealth have some level of defences and military presence. However, this is especially the case in those places on the fringes of the New Commonwealth, such as Chipangu, central America, the Philippines, Britain, Iceland and the Faroe Islands. The last three sets of defences, acting together, allow the New Commonwealth to essentially prevent any ships other than their own passing into the North Atlantic. The New Commonwealth has very austere and plain styles of dress, food, architecture and so on. Buildings, while often impressive and well-built, are always very plain. The only major use of colour and decoration is in propaganda, particularly posters promoting Cromwell (the Defender of the Faith), and organisations such as the 'Puritan Youth' and the 'League of Maidens'. Sometimes gravestones are also highly decorated. There is lots of patriotic fervour, with marches and so on as the soldiers of the New Commonwealth go off to and return from war, or just their National Service. Many things are prohibited in the New Commonwealth, particularly since the rise of Puritan conservatism in recent decades. Alcohol, tobacco, singing, dancing and theatres are all banned. Despite this, parts of the New Commonwealth are rife with illicit breweries, stills and, where the climate allows, tobacco patches. Illicit dancehalls and other places of entertainment are also quite widespread. The only legal type of theatre is in the production of passion plays, stylised theatrical events held by (and usually in) a church to illustrate some biblical truth or virtue. Public readings, usually of the bible or similar approved texts are also widespread. Some of these last for hours or days and are performed as signs of devotion. In recent years there have also been some attempts to introduce a form of propaganda-cabaret to the New Commonwealth, where the show as a whole attempts to turn the people and nations opposing the New Commonwealth into a laughing stock. Semi-legal in nature, these have not really caught on outside of a few of the major cities, where they are considered to be very avant-garde. Sporting events are very popular in the New Commonwealth, and most towns and cities have their own teams who play the Puritan World versions of football, athletics, hurley and so on. Live large-scale chess games, with people playing the parts of the chess pieces in appropriate costumes as a form of 'performance game', are also quite popular. However, no sports or games are played on a Sunday. Coffee shops are quite common in the New Commonwealth, as coffee is one of the few vices not to be prohibited there. These are often also secret drinking parlours, with alcohol being served in coffee cups. This last is often referred to as the 'Scottish Blend'. There is also quite a lot of smuggling of prohibited goods (drink, books and so on) into the New Commonwealth from South America or from Europe. Puritans refer to one another as 'Brother' and 'Sister'. They may also address one another as 'Good Puritan', if they do not know the name of the other person. The Arch-Bishops of Boston and the Bishops of other bishoprics are referred to as 'Your Grace', whereas lower members of the clerical orders are referred to as 'Sir Priest'. Deacons, Sextons and so on are referred to as 'Master' or, if of obviously lower economic status, 'Goodman'. 'Goodwife' (or 'Goody') is the Puritan form of address for any woman, even including those accused of witchcraft. People from outside the New Commonwealth usually refer to its citizens as Puritans, and that word has, over the years, changed from its religious meaning to be synonymous with 'citizen of the New Commonwealth'. There are still many people of Native American descent in the New Commonwealth. However, the various Native American cultures have been largely wiped out, with the people having been 'civilised' by either the Spanish or the New Commonwealth. In many cases this included the removal of children from their families to ensure that they were raised in a 'civilised' fashion. There are various underground groups struggling to keep the old ways alive, but they are as persecuted as underground Catholics. Permits are required for many activities within the New Commonwealth. The most important of these are the Permit to Travel, required for anyone who wishes to use any means of transport other than walking or to visit places outside their home area. It also acts as a form of 'bus pass', being issued and paid for on a periodic basis. The New Commonwealth uses the Julian calendar rather than the more accurate and more modern Gregorian calendar. This is because the Julian calendar was used in England when the original Commonwealth was formed, and because the Gregorian calendar is seen as a false Catholic system not to be used by godly folk. As such dates in the New Commonwealth are significantly out of step with those of the Octuple Alliance and their colonies. Puritan theology is a version of Calvinism. As such, it asserts that humankind is basically sinful, but that, despite their sins, by God's decree some will be saved through the righteousness of Christ. However, in this life no-one can be certain what their destiny will be, whether they will be saved or not. The experience of conversion, in which the soul is touched by the Holy Spirit, and the heart is turned from sinfulness to holiness, is an indication (though not an infallible one) that one is of the elect. The experience of conversion is thus central to Puritan spirituality, and much of Puritan preaching is concerned with it. In particular, there is great concern over questions regarding how conversion comes about. Is it in a blinding flash, as with Saint Paul on the road to Damascus, or does it happen following well-defined stages of preparation? Also, how can actual conversion be distinguished from the counterfeit, and why will not everyone be converted? Puritan spiritual life stresses self-discipline and introspection, through which they seek to determine whether particular spiritual strivings are genuine marks of sainthood. Although full assurance is never attained, the conviction of having been chosen by God fortifies the Puritans to contend with wantonness in the rest of the world, ensures their faithfulness to the church, and allows them to endure the hardships involved in trying to create a Christian commonwealth in the world. As such Puritans do not hesitate to pursue any evils that they may discover with the Holy Wrath that the Lord inspires in them. Puritanism has not been static and unchanging over the years. At first it simply stood for reform of worship, but it came to attack episcopacy - church government by bishops, as in the Church of England - as unscriptural. Instead most Puritans were Congregationalists and Presbyterians, with churches run at a local level. The existence of the posts of Arch-Bishop and Bishop has always been opposed by more hard-line Puritans, so that the power of these posts has varied in synchrony with the power of the more relgiously moderate Puritans. In the present day their power is somewhat limited, but still far from insignificant. Priests in some places, and particularly in the military, are political officers to keep an eye on people and their ideology. It is also not unknown for the New Commonwealth to use torture, drugs and brainwashing to ensure the conversion of sinners when this is considered necessary. The many churches in the New Commonwealth are not named after saints, as this is considered too 'popish'. They are named for their location, or for Christ alone (for example, the Cathedral of Christ in Boston). The wife of the Lord Protector is Margaret Cromwell. The Cromwells are currently childless. As such the current heir is his nephew Ephraim Cromwell, presently aged sixteen. The Council of State. This administers the New Commonwealth for the Lord Protector, and is headed by Hiram Wollaston, the Vice-Chancellor of the New Commonwealth. Parliament, an organisation of one house to which people are elected by the eligible citizens of the New Commonwealth. The Ministry of Security - run by the Committee of State Security. The Special Puritan Guard (the SPG) - also run by the Committee of State Security, they act as bodyguards and secret police for the Cromwells. The New Model Army. This is run by General Jeremiah Fairfax. The New Model Navy. Very much the secondary service to the New Model Army, this is run by General Lucas McDonald. The Boston Herald - the newspaper of the New Commonwealth, it is run by the State Bureau of Information. The Massachusetts Broadcasting Corporation (MBC) - also run by the State Bureau of Information. The League of Maidens - an organisation very much like the Puritan Youth, but aimed at girls, and so focussed on activities rather different to those the Puritan Youth concentrate on. The Ministry of Agriculture. This is headed by Peter Aboyne. The Ministry of Industry. This is run by Benjamin Wentworth. The Ministry of State. This is run by Foreign Minister Richard Smithston and controls all matters relating to the interaction of the New Commonwealth with the other nations of the world. The Vice Minister of State, his second in command, is a man named Steven Hawke, a tall, very fat old man. The Solicitor General's Office. This is headed by Solicitor General Jedidiah Fleetworth. The Church. A major influence in government and New Commonwealth life, run from the Cathedral of Christ in Boston. It is currently headed by Arch-Bishop of Boston Abednego Harding. The Bank of Massachusetts. This is run by Noah Patterson. The Bank of New England. The many Major-Generalships into which the New Commonwealth is divided. The Watch - the police force of the New Commonwealth. The basic unit of currency in the New Commonwealth is the Pound, which subdivides into Shillings and Pence. There are also Crowns and Half-Crowns; these are not named after the crown of any earthly ruler, but instead after the Crown of Christ. 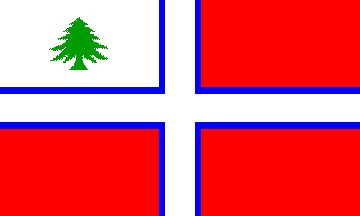 The first flag of the New Commonwealth was a modified version of that of the Massachusetts colony (which was a red field with a square white canton in the top left corner). In consisted of a red field with a blue-edged white cross centred on it, representing all of the colours of the old British flags. The top left corner was white with a green tree insignia in it. The current flag of the New Commonwealth was adopted in 1870 on the orders of the reactionary Lord Protector Hiram Cromwell. It is a plain black field with a white cross in the centre (rather like a black and white version of the real-world Swiss flag). The national anthem of the New Commonwealth is something of a very similar nature to "I know that my redeemer lives" from the real world. The capital of and the largest city in the New Commonwealth, Boston is also one of the largest cities in the world, with a population of several million people living along its cobbled and tarmaced streets. It may well also be the plainest and dullest city on Earth. The Boston skyline is dominated by the Cathedral of Christ, a vast and austere structure built on Beacon Hill in the centre of the city. Boston consists of houses and tenement buildings that, without elevators, are limited to no more than eight stories high. Churches are dotted amongst these, with factories sited far out from the centre, so the Cathedral towers over everything. However, although built of the finest white marble, it no longer gleams, having become, over the years, coated with a thick patina of airborne grime. All of the older buildings of the city are also coated with this grime. Directly adjacent to the Cathedral is the Lord Protector's Residence, a large, plain house inhabited by the Lord Protector and his family. Around the Cathedral are to be found the buildings of the various Ministries and offices making up the government of the New Commonwealth. Secret tunnels link the Lord Protector's Residence with a number of the Ministries. Boston has extensive port facilities, and a large aerolon. It also lies at the centre of an extensive system of canals, railway lines and roads linking it to many other places in Massachusetts and beyond. An extensive system of elevated railways provides public transport within the city (as is the case in many other cities of the New Commonwealth). The city is also a major industrial centre. Many factories and power stations are sited outside the centre of the city, linked into the general transport system by dedicated roads, railways and canals. In particular, Boston is the headquarters of the Massachusetts Motor Company (the MMC), the largest land vehicle manufacturer in the New Commonwealth, who have a large factory complex in the outer reaches of the city. There are extensive defences around Boston, mostly dating back to the time of the War of Holy Liberation (from 1690 to 1705), and as such many of them have been subsumed into parts of the city that have grown up since then, and are no longer used. The defences of Boston Harbour are still fully functional, however. The defences of the city are centred on Boston Castle, a large star-shaped structure with walls designed to deflect cannon fire and provide the best defences available at the time it was built in the early eighteenth century. It overlooks the Old Harbour. Although still a fortress, Boston Castle is now the feared headquarters of the Ministry of Security. Many religious and political prisoners are taken there, never to be seen again. In the wing for these prisoners, the floors are carpeted and silence is the rule; everyone there wears masks. This is so that the inmates do not know when people are being moved around, and no-one inside the prison, on either side, knows with certainty who is there. Most other coastal New Commonwealth cities have shoreline and harbour defences of one kind or another. The prime meridian used by the New Commonwealth (but by no-one else) runs through the alter of the Cathedral of Christ in Boston. A minor kingdom on the periphery of Europe, strongly allied with France, Britain has had little role in world affairs since the civil wars of the seventeenth century and the loss of its American colonies in the creation of the New Commonwealth. Ruled by a succession of despotic monarchs as a French satellite, with a mixed English and French nobility and an essentially powerless Parliament, its industry and general development have been continuously held back by royal extravagance and tyranny, as well as a great deal of internal strife and emigration to various parts of the world by those, such as Protestants, persecuted by the system. As such Britain never became a world power. There has never been a United Kingdom; instead British Monarchs have been King or Queen of Great Britain only. The thrones of England and Ireland never unified, and the Kingdom of Ireland remained in personal union with the Kingdom of England, its throne occupied by the reigning King of England. Although not industrialised to any significant extent, Britain does have extensive mineral resources, particularly iron and coal, that they exported to many nations on the continent, but chiefly to France. Because of its lack of industrialisation, few canals or railways were built in Britain, and those that were, were built mainly as prestige projects rather than for practical reasons. The few British railway lines all run to and from London, to the London Terminus station, that is roughly where Buckingham Palace stands in the real world. This has a large switching and goods yard behind (to the west of) it. From it lines ran to Dover, Harwich, Folkestone, Edinburgh (via Newcastle and York), Portsmouth and Southampton, Tilbury (on the north side of the Thames) and Gravesend (on the south side of the Thames). British roads are very poor, and most cities still have cobbled streets, where the streets are paved at all. As another side effect of Britain's lack of development, the Fens of East Anglia have never been drained. As such they are still a wild place, a hideout of rebels and religious dissidents. Ely is still an island. Also, Wales is known as 'West England', and there is no city of Birmingham [as it could not grow much with the transport links provided by the canal system]. The flag of Britain under the Bourbon Dynasty was similar to the modern real world Union Jack, but without the diagonal red stripes representing Ireland. In 1923 Britain was invaded by the New Commonwealth, and was quickly put under Puritan control. Since then it has suffered many purges and uprisings, but has also been forcibly industrialised. New railway lines from London to Liverpool, Bristol and Plymouth have been built, to improve access to the major trans-Atlantic ports. Most British lines are a mixture of the European and New Commonwealth gauges, although the old gauge is slowly being phased out. Because of its forced industrialisation, Britain is now quite heavily polluted in places. Britain is now one of the Major-Generalships of the New Commonwealth, ruled from the Palace of Whitehall in London by General Paul Windebanke. New defences have been put in place along the coastlines facing the continent, along the south and east coasts of England and on both sides of the mouth of the Thames. From having had a population of about eight million at the time of the invasion, the population of Britain has been swollen by Commonwealth immigrants to roughly twelve million in 1995. The Organisation of Revolutionary Justice. The 'Voice of Liberty' radio station. The Holy War Direct Action Group. The Soldiers of the Blessed Virgin - in Southern Ireland. The Sacred Heart Death Brigade. The Irish Royalist Army - in northern Ireland. The Fen Tigers - in the (un-drained) Fens of East Anglia. Note that because Britain never developed into a major power, the English Channel is generally known as 'La Manche'. Puritan World London is very different to the London of the real world. The shape of the river running through the city is the same, and some locations, such as Westminster Abbey, St Paul's Cathedral and Whitehall, match (in name at least) those of the real world, although the actual places may be different. For example, St Paul's Cathedral, although rebuilt by Christopher Wren after the (different) Great Fire of London, is different to that in the real world. Some places retain their old names, such as Tyburn [Marble Arch]. Other places do not correspond to anywhere in the real world, such as Naseby Circus, Westminster Square, Ireton Square, Marston Embankment and Bosworth Square, and across the whole city the layout of the smaller streets is very different to that in the real world. The major streets of London are tarmaced, but the smaller streets are cobbled, where they are paved at all. The overall shape of the city is also different. It runs along the Thames much as it does in the real world, extending as far as Tilbury and Gravesend to the east in a mass of dock areas, but does not even reach Hampstead, Willsden or Harrow in the north or Stretham or Catford in the south. These places, suburbs in the real world, are all still separate towns or villages here. The bridges across the Thames are also different. London Bridge is in the same place, but there are no bridges further down the Thames than it (such as Tower Bridge). The other bridges are St Paul's Bridge (by St Paul's Cathedral), the Strand Bridge (close to where Waterloo Bridge is in the real world), Westminster Bridge and Milbank Bridge (close to where Vauxhall Bridge is in the real world). In addition to being a road bridge, Milbank Bridge is a huge structure containing many railway lines where all of the railways that run south of the Thames cross the river. There is very little public transport. There is no underground railway system, and few buses. Some canals run through parts of the city. The only railway lines are the ones leading out of London to the south-east, the south, the west and the north, all from the London Terminus station. The Thames is filthy with pollution. The outer parts of the city are ringed with factories that belch smoke into the sky. These are visible from high places in the city. Most of the older parts of London have never been developed much beyond their state at the end of the Civil Wars. As such the City of London is still walled, with guarded gates in and out. Other changes have been made by the New Commonwealth since it took over. Wren's Westminster Palace still exists. However, it is now much plainer than it was, and is home to Paul Windebanke, the Governor-General of England. Westminster Abbey has also been made very plain, both inside and out, in Puritan style. There are no pews inside. Beside the Abbey is Westminster Square, where rallies and so on take place. There is no Parliament as such. Instead, Commonwealth House faces onto Westminster Square. It is from here that the business of governing Britain takes place. Beside it is the feared Ministry of Security, home of the British parts of the Committee of State Security. Close to Westminster, along the Strand, is the Hotel New England, the best hotel in London. This is where important visitors from the heartland of the New Commonwealth stay. The Tower of London, to the east, is the Military Headquarters of all of the British Military, as well as the main London armoury. Traitor's Gate acts as a discrete entrance and exit to the Tower. Gunboats moor on its Thames-side wall, and the moat remains water-filled. Further out, the slums and rookeries of outer London are dotted with the walled barracks of the Security Police and the SPG, who enforce order throughout the city. Political prisoners apprehended by them are sent to the Ministry of Security; other prisoners go to the Islington Internment Camp. Further to the east is to be found the Tilbury Aerolon, where civilian and military aircraft arrive at and depart from Britain. It has the facilities to handle both seaplanes and normal aeroplanes. Before the Puritan takeover the Throne of Ireland was occupied by the reigning King of England, with the kingdom of Ireland in personal union with the Kingdom of England [There was no equivalent of the Act of Union of 1800 in the real world which merged the Kingdom of Ireland and the Kingdom of Great Britain to create the United Kingdom of Great Britain and Ireland.]. The Kingdom of Ireland was governed by an executive under the control of the Lord Lieutenant, who was generally an English noblemen. Under the Lord Lieutenant the kingdom was run by the bicameral Parliament of Ireland, made up of the House of Lords and the House of Commons, and which met in Dublin. Because of the more Catholic monarchs of England and their interest in using Irish troops, Irish Catholics have been more tolerated down the years than they were in the real world. As such, the proportion of Protestants in Ireland before the invasion of the New Commonwealth was less than in the real world, and the Irish were some of the more sincere supporters of the English monarchy. This meant that the Irish in the more devout parts of Ireland, such as Ulster and Belfast, were those who resisted the New Commonwealth invasion the most, and paid a heavy price for it in atrocity and death. As is the case in England, since the invasion the Irish population has been swollen by immigrants from the New Commonwealth to about fifty percent more than its value before it. 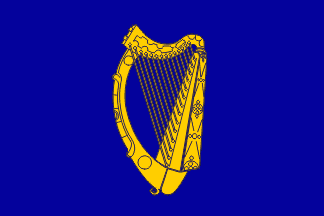 The flag of Ireland under the Bourbon Dynasty was the traditional Irish design of a gold harp on a blue field. Go to the Puritan World Timeline, Science and Technology, Society or Differences Pages. The flags shown on this page are taken or derived from those shown on the Flags of the World web site. They are used here without permission but for personal game use only and not for profit or commercial gain.